Recently, increasing attention has been paid to the effects the hard-hitting nature of football has on a player’s brain. Frequent and severe concussions have prompted questions about the wide-ranging and long-lasting consequences of brain injuries. A New York Times article recently detailed new information on just how the brain is affected when experiencing a hard blow. That article, and others, highlights both how impactful these injuries can be and how much more there is to learn about them. One fact all experts in the field agree on is the seriousness of a brain injury, and one need not be an elite level athlete to experience this type of devastating injury. A National Institute of Health published study stated that traumatic brain injury is one of the most common work-related injuries. In 2015, over 168,000 head injuries occurred at work. For these workers and their families, the effects can be long-lasting and serious. Often, they need help, but they aren’t sure where to turn or what to expect. Here, we look closely at common brain injuries and their effects. Concussion – The brain experiences trauma that stretches blood vessels and damages nerves. Contusion – Similar to a concussion, blood vessels and nerves are damaged, but the injured person also experienced bleeding in the brain. Diffuse axonal injury – The head is shaken or twisted, causing tearing of nerve tissue. It is also possible that the injury releases certain chemicals that can cause further damage to the brain. Penetrating injury – Impact from an object, such as a knife or bullet, hits the brain and may force foreign object particles into the brain. Coup-contrecoup – The blow is so severe that a person experiences contusions both at the site of the blow and on the opposite side of the head, which occurs when the brain essentially bounces back toward the opposite side of the skull after impact. Every injury is unique, and individuals can experience different symptoms even if they suffer a similar injury. 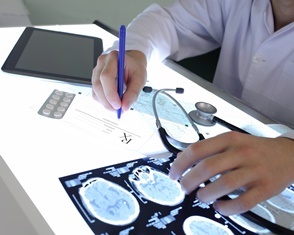 Work closely with a qualified medical team to understand the full scope of a brain injury soon. Employers should take care to ensure that work conditions are safe. Slippery floors, uneven floors, unsecured tools and machinery, improperly maintained vehicles, and much more can increase the likelihood that an employee will suffer an injury. Employees should take care to heed warnings and wear proper protective equipment when possible. Unfortunately, it simply isn’t possible to prevent all accidents and injuries. When these serious injuries occur at work, the workers’ compensation system offers benefits to help the injured worker obtain the medical treatment he needs and to continue to meet his financial obligations while missing work. The symptoms and severity of brain injury may not be obvious right away, so it is important to both seek medical help and report an injury or illness to an employer soon. And an experienced workers’ compensation attorney can help you understand your rights and help you pursue the appropriate benefits. Brain injuries can be serious and long-lasting. Sometimes, the employee’s life is forever changed. The stakes can be high, and workers deserve the maximum compensation to which they are entitled. The experienced attorneys at Monast Law Office are here to help injured Ohio workers do just that. Call our Upper Arlington workers' compensation law office today to speak with a member of our team and schedule a free, no-obligation consultation.